Aphrodite Bouikidis of the Global Diaspora Initiative found the lucky coin in her slice of the cake at AGAPW’s festive cutting of the New Year’s Βασιλοπιτα at the Trump World Bar on January 18th, another fun, upbeat AGAPW gathering promoting a serious purpose: All proceeds from the event will be allocated to AGAPW’s Excellence Tuition Scholarship to be awarded in March 2013*. The 2012 Excellence Tuition Scholarship, presented to Queens College student Alexandra Kavouras, in honor of Mrs. Penelope Tsilas when she received AGAPW’s Woman of the Year award, is awarded to a female student of Greek descent enrolled in a four-year accredited Bachelor’s degree program who meets selection criteria based on academic excellence, contribution to the community and financial need. Bringing the GN up to date on AGAPW, president and founder Olga Alexakos referred to this tax exempt, charitable and educational organization seeking to expand career opportunities and promote community and leadership building among Greek-American professional women, as “the talk of the town!” Olga got that right. GN: What was your vision when you founded the organization? What did you hope AGAPW would accomplish? OA: AGAPW came into existence in the beginning of 2010, right in the middle of the financial crisis; it was born out of the desire to build a community of women that could share resources, learn from one another, support each other, and celebrate together. It was an idea whose time had come to become a reality. The response has been enthusiastic and huge from the very beginning. Greek American women of various ages and backgrounds, as well as many men have welcomed AGAPW into their lives. GN: Has AGAPW met its original goals? OA: We have had a very clear-stated mission and are happy to say that we have stayed on course and kept growing. The organization was awarded a 501(c) 3 status in 2011. This last summer, it was also approved for Local and State tax exemption, as well as exemption of sales taxes. When we formed AGAPW, we had given it three years to take shape and mature as an organization, to complete all the legal requirements for tax exempt status, introduce its mission to the community, build a presence, become part of our lives….happily, its success has surpassed all expectations. GN: How has AGAPW developed since its founding in 2010? OA: Given our limited funds, we have relied from the very beginning on the generosity of our supporters, who opened their homes and offered space in their offices and their private establishments. Women supporters and restauranteurs donated and handled the catering of food, and speakers spoke pro bono. In other words, we made every effort to identify and utilize available resources as effectively as possible; this way, we have been able to keep most of our events free or to request small contributions. GN: Can that operative continue? OA: We are very pleased that we have been able to have important events of substance very frequently, monthly or bi-monthly with a minimal budget. I must admit though, that as the popularity of our events has risen dramatically, we are exhausting our ability to rely exclusively on good will! GN: Has the organization changed direction as it has gone along, either subtly or in major ways? OA: As the organization becomes better known and more established, our resource potential is growing, and we hope to be able to offer more services to our community, reach an even larger number of women, and integrate more women into the organization. GN: What is one of the new services? OA: We are proud that we have established an Excellence Tuition Scholarship Award for women college undergraduates. Last year we awarded $3,000,and this year we hope to be able to award a higher amount. There is great need and great talent, and we hope to have the funds in the near future to offer more scholarships to deserving young women at the graduate level as well. GN: Please talk about that. OA: We would love to be able to award a special scholarship to older women who are returning to college later in life, after they’ve raised their children and sent them off to college, or women who have decided to go back to school in mid-life to improve their employment opportunities. GN: How are people are reacting to AGAPW? Are more people attending the events than at the start? OA: We’ve had a warm and enthusiastic response from the very beginning, and participation is continuing steadily and in large numbers. Many of our events, for example the celebration of International Women’s Day, the Greek American Woman of the Year Award, or the celebration of the Mothers of the Greek Diaspora in May, as well as presentations by popular speakers, are sold out and over capacity. The charisma and good will of Greek American women is overflowing! AGAPW events have become “the talk of the town!” They are exciting, interesting, informative, fun, wonderful opportunities to make new friends or see old friends learn and enjoy. At our gatherings, there is exuberance, a sense of purpose and the sheer joy of being in the company of friends supporting each other! How can you miss attending?! GN: What do you think motivates individuals to attend AGAPW events? OA: Clearly, AGAPW is a lot about relationships and building community and leadership. Whether the goal is personal support, learning, business networking and career promotion, or enjoyment of the arts, the rich diversity of our AGAPW community has plenty to offer. Furthermore, we have wanted to strengthen our links and promote a greater presence of our community in the fabric of New York City. The Greek American diaspora in New York is very large and very successful. We believe that it can play an even greater role in the life of the city, in a more organized and active manner. Part of our vision is to create connections with other organizations, both inside and outside the Greek American community. We are happy to say that we have been successful in accomplishing this. A case in point is our upcoming Forum on Human Trafficking, scheduled for February 25th, organized in conjunction with the Center of International Human Rights at John Jay College. Through our various efforts students at the college level as well as the high school level will be attending the Forum. GN: Does AGAPW seek affiliations? 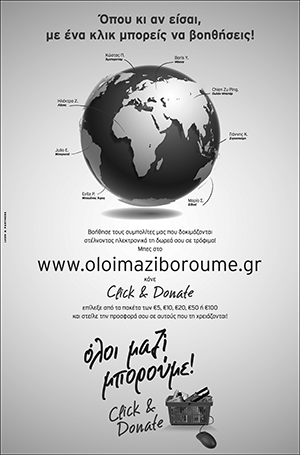 OA: We would like to establish ongoing relationships with women’s organizations in Greece and be in a strong position to offer our support during these challenging times. GN: How can the community help AGAPW achieve its goals? employment, share job openings, offer seminars, make time available to mentor younger women. We hope to in the near future have our own offices, a space we can call home. This will make communication and mutual support all the more easier and effective. We would like to invite our community to embrace AGAPW financially so we may be better able to bring together and grow and harvest the tremendous good will and charisma and love of the women of our community. The community can only benefit from this. The needs are great, but the talents and resources of our vibrant community are limitless. As AGAPW is entering its next phase, we believe that the organization is well placed to grow and expand into an ever-increasing resource for our community. Coming up on Monday, February 25th at John Jay College: Forum on Human Trafficking, with George Andreopoulos, (Professor of Political Science and Criminal Justice, at CUNY; Director, Center for International Human Rights, John Jay College, CUNY, as one of the panelists, and showing of UNICEF film, Not My Life. For information go to agapw.org/events. For further questions on applying for the scholarship or donations to the scholarship fund, please contact Dr. Aphrodite Navab at desireenavab@yahoo.com.